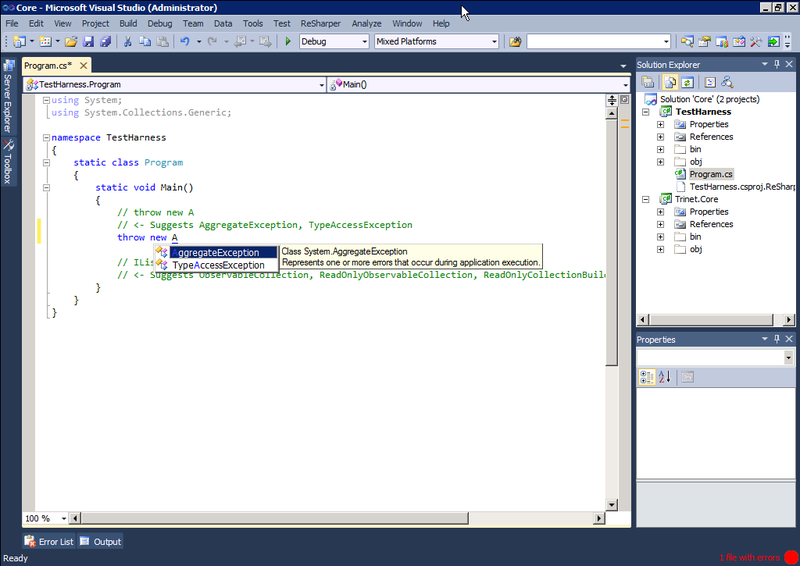 When typing throw new and the Resharper dialog opens suggesting various exceptions to throw, NotImplementedException for some reason is not included in that list and requires me to manually type it out fully. Yes, I see the same. Pretty irritating since I'm sure v5 used to do this correctly. I have a similar problem in a couple of large-ish solutions, where ArgumentException and ArgumentNullException aren't in the smart completion list. I'm used to typing "thr<TAB>ANE<TAB>" and getting "throw new ArgumentNullException(|)", but in this project, I get "throw new ANE<TAB>|" instead. Typing "thr<TAB>A<CTRL+SPACE>NE" works as expected, but isn't as convenient. Another related issue I reported a couple of days ago - in some large-ish solutions, typing "IList<T> list = new " won't suggest List<T>. 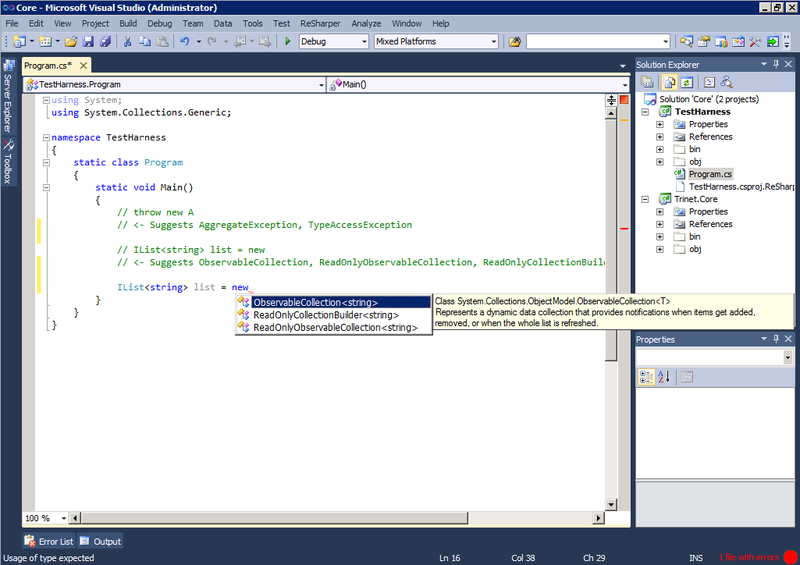 Clearing the caches from with R# doesn't resolve the problem, and neither does closing VS2010 and deleting the "_ReSharper.Solution" directory. I've tried reproducing this behavior on large solutions but with no success. as expected, but isn't as convenient. typing "IList<T> list = new " won't suggest List<T>. neither does closing VS2010 and deleting the "_ReSharper.Solution"
I think there are some serious problems with smart completion in R# 6. OK, I've managed to reproduce both the "ArgumentNullException" and the "List<T>" problems on a stripped-down version of my solution, running on a clean PC with no other extensions or add-ins installed. A 4Mb zip file is on its way to you! list = new ' from your example? on a clean PC with no other extensions or add-ins installed. Both screen-shots are from a clean PC, with no other add-ins or extensions installed, and all the default settings for VS2010 and R# 6.
and our devs will continue looking into this problem. Thank you!